Coordination with multiple people (e.g. end user, internal IT and integration developer) is required. This is not an easy task. But in this latest update to iON, we’ve introduced a number of features that make this easier than ever. Bubble up important exceptions that you must deal with, like data that is in an unexpected format or has unexpected lookup codes? Notify your customers or yourself when their integration isn’t working because can’t connect to a remote service? Send an email to your IT staff if your secure data gateway becomes disconnected so they can fix it? Get an email if a deployment fails so you can walk away from the computer while your application updates? Monitor your application usage so you can ensure that you have enough capacity? You can now with iON’s new alerting capabilities. Receive emails or notifications inside iON whenever any of these situations occur by configuring an alert inside iON. No more searching through logs. No more manually coordinating between your end users and IT staff. And no more worrying about if things are running correctly. We hope this makes supporting and managing your integrations easier than ever. 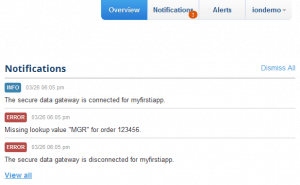 In addition to the ability to send alerts when the secure data gateway goes up or down, you can now clearly see the status of the secure data gateway on your application dashboard. No more wondering if your IT person has actually configured it correctly! 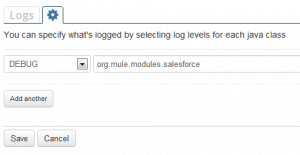 And at long last, you have the ability to change the log levels for your application. If you want to see what is going on behind the scenes with your application or connector, you can change the log settings and bump things up to debug levels. We’ve got a ton more exciting stuff coming to you over the next couple months. Watch out in April and May for some big announcements on how we’re taking the pain out of integration.